What a writer can do, what a fiction writer or a poet or an essay writer can do is re-engage people with their own humanity. Hi, I’m Jennifer, and welcome to the Write Right podcast. Today we’ll be discussing simple, compound, and complex sentences. So, let’s get started. What is a simple sentence? A simple sentence, sometimes referred to as an independent clause, consists of a subject and a verb and expresses a complete thought, such as in the example: “My dog loves to play fetch.” You have your subject, “dog,” and your verb, “loves,” expressing a complete thought. So, what’s a compound sentence? A compound sentence consists of two independent clauses–or simple sentences–joined together by a coordinating conjunction, which is typically preceded by a comma. Because two independent clauses are joined, the parts of the sentence on either side of the coordinating conjunction must be able to stand on their own as complete sentences without the conjunction. The seven English coordinating conjunctions are for, and, nor, but, or, yet, so. To help with memory, you might want to think of the acronym FANBOYS. However, coordinating conjunctions do not always mean compound sentences! Sometimes, they may signal a compound subject or a compound verb in other types of sentences. Such as in the sentence “My dog plays fetch and sleeps often,” “sleeps often” cannot stand on its own, and therefore it is not an independent clause but part of the compound verb “plays fetch and sleeps often” in this simple sentence. 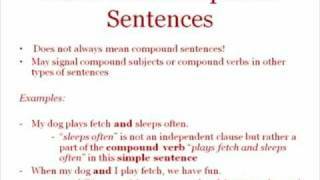 Similarly in the sentence “When my dog and I play fetch, we have fun,” “and I” is not an independent clause but part of the compound subject “my dog and I” in this complex sentence. When a subordinator begins the complex sentence, a comma is necessary after the dependent clause. So in the sentence, “Although she rarely brings the ball back, my dog loves to play fetch,” “although she rarely brings the ball back” begins the sentence with the subordinator “although” and is a dependent clause because it cannot stand on its own, therefore the comma is placed at the end of that clause. However, if the independent clause comes first no comma is necessary. So in the sentence, “My dog loves to play fetch although she never brings the ball back,” “My dog loves to play fetch” does not begin with a subordinator and is an independent clause, and therefore you do not need a comma. Each type of sentence can serve a different purpose, and so variety is key! Simple sentences can be short, concise, and to the point, and so they can help eliminate wordiness and provide clarity. However, too many simple sentences strung together can make your piece sound disconnected and choppy. Compound and complex sentences can provide richer detail and language and can more clearly relate two ideas, but too many of these can make your paper confusing and convoluted. Keep in mind the goal of your writing when you are deciding what type of sentence you want to use to express your idea. Thanks for listening to the Texas A&M University Writing Center’s Write Right podcast.